The average visitor to New Orleans is ignorant-of or unfamiliar about Preservation Hall. Many are shocked at the few seats and no air conditioning. The line starts 1 hour prior to show time. Preservation Hall -- Line Be early if you want a seat! It is hard to describe the feeling, the aurora, the momentary regression backwards-in-time into history that you acquire. It can’t occur by listening to a CD. You must be there. Louisiana culture began long before the Louisiana Purchase in 1803. Signs of Spanish and French rule are apparent in the state's architecture, cuisine & lingo. New Orleans features many attractions.. 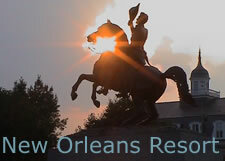 Check out a jazz combo while you visit the French Quarter or go for a riverboat ride on the Mississippi. While New Orleans will give you a taste of Cajun Country, you can get a full helping nearby on a swamp tour in the bayou. First driven out of France and then Canada before settling in Louisiana, the Cajuns have produced memorable cuisine: Dig into a bowl of gumbo or Cajun Catfish!